The Achtung! 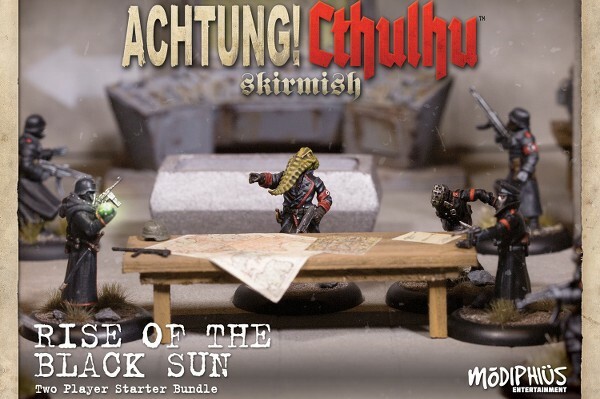 Cthulhu:Rise of the Black Sun Two Player Starter Box Bundle goes on WEB ONLY pre-order today. This includes all the contents of the Commander's Set plus the 32 page Rise of the Black Sun Campaign book (also available separately in PDF), an extra card deck and extra 15 dice (30 total), 3 x Allied Investigators (Professor Deadman, Natalya Petrova & Badger Harris), 3 x Pathfinder Demonhunters, 6 x Badger's Commando's, 1 Black Sun Villains (Master, Canon and Die Tote guard), 10 x Black Sun Troopers and 10 x Servitor's of Nyarlathotep Horde. 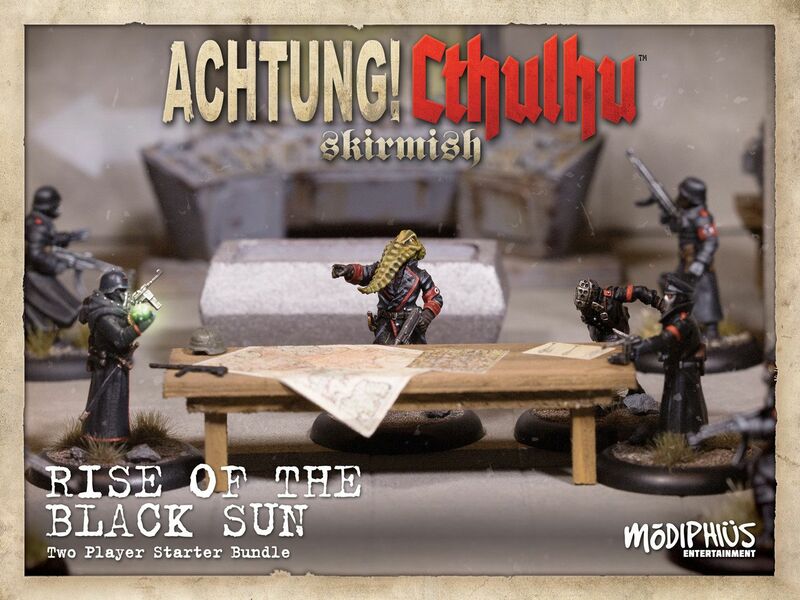 A fast paced wargame rule set combining World War Two and the Cthulhu Mythos. Based on the highly successful Dystopian Legions by Spartan Games. Call for reinforcements like the Deep One war party, Servitors of Nyarlathotep Horde, Badger's Commandos or Demonhunter Pathfinders to rule the battlefield along. Track the growing influence of the Mythos over the battlefield. As the Mythos Influence Level rises, strange and terrible things begin to happen to those involved in the conflict. New Tactical Action Cards and MARs 'Model Assigned Rules'-that capture the feel and flavour of the Achtung! Cthulhu settings. Special rules for Mythos powers, spells and artefacts. Stats for Achtung! Cthulhu forces as well as standard historical infantry, support weapons, vehicles and tanks. Players from either side can bring powerful spellcasters to bear-weaving battlefield spells to ensure victory over their enemy. Expand your campaigns with hero and villain characters like Sgt Brandon Carter, Ariane D'bois or 'Sweet' Liesel Bohm, Adawolfa Gabler, or Franz 'the Blackbird' Amsel. Further narrative campaigns and expansion sets throughout the year will expand and enhance your Achtung! Cthulhu adventures! Really looking forward to playing this, but I've got a question, I was an original Kickstarter backer of this and got an email from you about a voucher to redeem for money in the store. I have sent two emails asking how I go about using the credit against the two player set but haven't heard back. When will we hear how to do it? I ordered this a while ago and was wondering whether you have a planned release date yet? We plan to ship these out in July, barring any sabotage from the Black Sun. Any firmer dates on release for the game? "PDF Downloads will be made available as they are completed. The Rulebook will be downloadable in May, the campaign in June." Hi, I was wondering where I can get these pdfs from. I have checked my spam folder but don't see any notification. Cheers. We should have the PDFs ready soon, within the next couple of weeks. You should get an email telling you it's ready. As soon as I get my email, I will post it here, well not right here, I'll post it at the top level for this game. The game is currently at the printer and should be ready for distribution in November. I talked with the Line Manager and he's going to try to get the PDF out next week. Where do we download the PDF? If you pre-ordered you'll get an email with a link to it when it's actually ready. Has anyone received theirs yet? I have not received mine yet - however I am in Texas so may take awhile. Im in Oklahoma.its usually 10 days or so, but we had all that extra holiday shipping. After a wee bit of confusion, mine finally landed in Oklahoma. @Kurt, did you ever get yours? Steve, - no I have not. I have contacted Lloyd.